County Galway was one of the few places outside Dublin to have taken an active part in the 1916 Easter Week Rising. On Monday evening of that week news of the insurrection reached the Galway countryside and local volunteers from Claregalway and Castlegar began to mobilise. The supporters of these men of 1916 became known as Sinn Féiners. The leader of the Claregalway men was Tom Ruane who was also the captain of the Claregalway hurling team. Other officers in the Claregalway Company included Nicko Kyne, George Glynn and Patrick Feeney. Many men from the Claregalway hurling team had joined the IRA. Together with the officers, the men made their way to an initial meeting at Carnmore Cross. At Carnmore, they rendezvoused with the Castlegar men under Brian Molloy and Pat Callanan. Orders came from Liam Mellows via Padraig Feeney to tell the two companies to proceed to Moyode. This was agreed for daybreak the following day and leaders Tom Ruane and Pat Callanan went to rest for a few hours. As they rested, a group of policemen travelled on reconnaissance through the Castlegar and Carnmore areas. On arriving at Carnmore Cross, they came across the Volunteers. An initial shot was fired by the Volunteers side killing a Constable Whelan, who was the first fatality of the Rising outside of Dublin. Ruane and Callanan now arrived on the scene to find the men in a buoyant mood and they began marching to Moyode. Despite their limited arsenal of weapons, pikes, forks and a few shotguns, the mood within the camp was optimistic as they awaited orders from Mellows. As the days went by and no action was ordered, times were getting harder for Mellows men, as food was difficult to come by. After some time Fr. Feeney from Castlegar begged them to go home. Cold and hungry, they left Moyode with whatever weapons they had with them. As they got more tired and hungry, they dropped their weapons, with the result that John Concannon from Montiagh was one of the few to return with his gun. They were so weak that even Henry Duggan came home without his boots, being too weak to carry them. In the aftermath of 1916, came the hunt for the rebels. Descriptions of those on the run were published in the police bulletin Hue and Cry. Nicko Kyne from Kiltrogue village was charged with “having on the 25th April 1916 and subsequent dates at Carnmore and Oranmore, committed various acts of rebellion.” Many others were also accused of similar crimes and were pursued as a result of this bulletin. Two hundred police from Northern Ireland were drafted into Galway to assist the local force. Houses of suspected rebels were torn apart in an effort to find weapons. In one week alone two hundred and seventy rebels were arrested and sent to Dublin by warship, but later prison trains were used to transport the prisoners. Everyone was housed in Richmond Barracks and while there, many were court-martialled. The leader of the Castlegar Company, Brian Molloy was sentenced to death in relation to the death of Constable Whelan at Carnmore Cross, but this was later commuted to ten years penal servitude. By July 1917 most prisoners were home again, and it was such people who formed the core of the IRA. Included among the people who went on the run was Tom Ruane. He headed for Moycullen and he travelled out onto an island in Lough Corrib whenever he was in danger. The police and the army came looking for him on several occasions. He escaped arrest because the Irish Secret Service was able to inform him in advance of the British plans. A reward of £1,000 was offered for his capture. Eventually by a stroke of misfortune, his wife’s handbag was snatched by two R.I.C. men in Galway. Contained in the bag was a letter, which bore his address at Bohans, Borra, Moycullen. Tom Ruane was arrested, taken to the police station in Galway and later deported to the internment camp in Frangoch, Wales, where he spent ten months. He was arrested again in 1918, in connection with the so-called German plot, jailed in Wormswood Scrubs and later in Winson Green, Birmingham. In 1920, the Black & Tans arrived in Ireland and brought with them a reign of terror, torture and murder as part of the British response to the Irish Declaration of Independence. The parish of Claregalway suffered along with other parts. The Tans took their names from their khaki and black uniforms and were said to have been sent to Ireland because of their savagery. They travelled throughout the countryside in “Crossley Tenders” sitting in two rows opposite each other. They shot indiscriminately at everything and everybody would run for cover when they heard the lorries approach. People lived in constant fear for their lives and homes and many slept fully clothed because if they took too long to open a door, the Tans would break the door down. Searches took place in the houses of known Republicans and sympathisers. As well as shooting their intended targets, they often beat or shot other family members. In a raid on Egans pub in Cashla, the owner of the pub Thomas Egan was shot dead having been accused by the Tans of withholding information. To add insult to injury, the Tans then limited the numbers attending his funeral to the extent where even his closest relatives were afraid to attend. The Tans also killed John Hanlon of Lackagh. Charles Quinn from Claregalway was injured in a failed ambush on the Black & Tans. People were waiting on both sides of the road but a badly aimed grenade knocked a wall on some of the ambushers exposing them to the Tans gunfire. Quinn was injured and taken to the Infirmary in Prospect hill (what used to be the old county buildings). A nurse in the Infirmary, who was dating an R.I.C. man, told him that Quinn was a patient. However Quinn was taken away before he was to be killed. Two Tans also threatened Fr. Moran because he was a known Republican sympathiser. It took the intervention of another soldier to prevent his execution. However this did not prevent them plotting to burn his and other big houses in the area. This plot also involved the attempted burning of Cahills Post Office, but for the vigilance of locals who hunted the arsonist/ex soldier from the scene. If the burning had succeeded, it would have given the Black & Tans the ideal excuse for the retaliation that they sought. 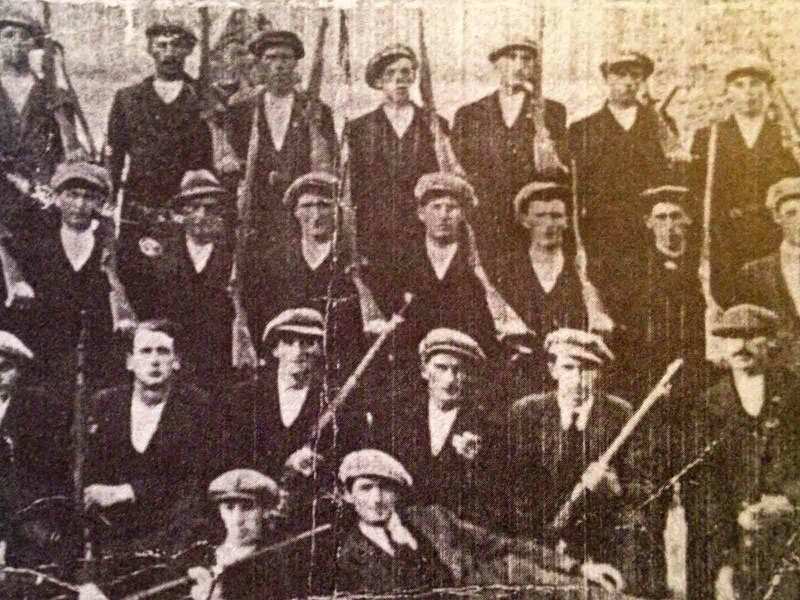 In May 1920, the mid-Galway Brigade IRA launched an attacked on the R.I.C. barracks in Loughgeorge. The barracks was manned by nine R.I.C. men and a sergeant. The Loughgeorge barracks was an important strategic post. The barracks was built of sandstone walls and was surrounded by barbed wire. IRA policy at the time was to make such military posts no longer fit to occupy and to force their complete evacuation. The roads between Loughgeorge and Galway and between Loughgeorge and Oranmore were to be blocked and mined so as to prevent reinforcements coming. The attack took place at night. A bomb was placed against the wall and it blew up half the gable wall. It also blew the gable of Duggan’s workshop next door. Following the explosion the attackers poured rifle and revolver fire through the hole. Nobody was killed in this incident, the only casualty being a constable who was injured by flying glass. Eventually the attackers withdrew, after which the R.I.C. put on a show of force by firing and sending up flares. The Duggan family who lived next door fled their home until the attack was over, their horse and foal having being killed. Reinforcements from Eglington Street, who had been sent for, were delayed because the attackers, who all escaped, had blocked the road by felling trees and by building a wall. Tom Ruane was a native of Carnmore and joined the IRB when it was formed in 1908. As we have already seen from the 1916 Rising, he was an active member of the GAA, captaining the hurling side from 1910 to 1916, his favourite position being that of full back. He was also a member of the County Board for a number of years. In 1916 he was in Moyode with the Galway Brigade under the command of Liam Mellows and when this was disbanded he went on the run. After his release from Birmingham Prison, he was appointed a justice of the Sinn Féin courts for south and west Galway. He was subsequently on the run from the Black & Tans when there was a reward of £1,000 for his capture. He took the Republican side in 1920. As a reprisal for the Kilroe ambush, which occurred near Headford, all his farm produce including turf was burned. Tom Ruane was chairman of the old Galway District Council for seven years. He was elected to Galway County Council as a Sinn Féin member and was chairman of the Finance Committee. His horses ran in the local races and he also had an interest in greyhounds. Both his sons were involved in politics. Paddy was in Sinn Féin for 30 years and was elected to Galway County Council six times—he was also a committed GAA member and was local Treasurer for eighteen years. Stephen Ruane was a member of Fianna Fáil for many years. Erected by his widow, family and 1916 comrades of the Old IRA Claregalway, in memory of the Vice-Brigadier of the Second Western Division. Thomas Ruane Carnmore August 31st 1937. R.I.P. This would have been a turbulent time in Ireland and as we have already seen in Claregalway and surrounding areas. It would seem that anybody who emigrated to England, the United States, Australia or New Zealand were conscripted into their adopted country’s army. Bernie Fahey, an uncle of Brian Fahey and Evelyn Fox, went to New Zealand before the World War. He was conscripted into the New Zealand expeditionary force. He served in France where he was killed on active duty on 20th April 1917. John Glynn, from Corofin Parish, had emigrated to America. He was conscripted into the American army when World War I broke out. He served in France, survived and eventually returned home. He married Kate Hughes from Mullacuttra where he lived until his death. Pat Tynan was a Mayo man who lived with the Lenihans in Lakeview before the War. He returned to Claregalway where he worked as a postman until his retirement. He continued to live in Lakeview where he died on 11th May 1958 aged 81 years. He is buried in Claregalway cemetery. Known as the Emergency in Ireland, the Second World War epitomised life at it’s most cruel, a time of hardship, shortages, and rationing. There were two organisations active in the parish, the Local Defence Force and the Local Security Force. Most people from the age of sixteen upwards were involved in one or the other organisation. Their role was one of security and because of Ireland’s neutrality, neither British nor German invaders were welcome. Because there was very little industry in the country, Ireland was dependent on imports. Everything was scarce. Good quality flour was non-existent and people had to make do with a type of ‘black’ flour mixed with barley, making it almost impossible to bake. Fruits such as bananas, oranges didn’t arrive in the country at all and one could count themselves lucky if they had any currants or raisins at Christmas. Farmers were obliged to become self-sufficient and had to grow wheat by law. The farmers had a reasonable supply of meat as almost every house reared a pig. There was no mill in Claregalway or Carnmore and some people recall going over to Lishenavella to the mill. T.V.O. (Tractor Vaporising Oil), a kind of paraffin oil, was used to turn the mill. Rationing: Ration cards were sent out by the Government. The book was supposed to last for twelve months. One had to have so many coupons before getting clothes or shoes. Fabrics, such as threads, were of very poor quality—in fact everything was of a second hand rate. The law forbade the use of a car unless it was for a doctor, priest or soldier. Bicycle tyres had to be carefully minded because replacements were not available. Candles were also scarce and of a poor quality.